Welcome back to our Draft Podcast! Nick, Vito, Dirty Dietz, and Hamobone once again sit down, and pour a couple drinks, to talk NFL Draft. This episode, Draft Expert Nick gives us a rundown of how the Senior Bowl will affect players’ draft stock. After that, we discuss the NFL awards, HOF, and the Alex Smith trade. Then things descend into chaos as Vito goes over his mock draft while we grade each pick. We really put the drinking in Drinking and Mocking this week…fun drinking game: drink every time someone says “on a scale of” and whenever Vito picks an offensive lineman. 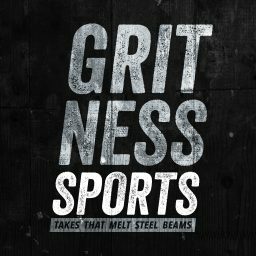 The podcast is also available on itunes(please rate and subscribe)under The Gritcast feed.